Healthy, economical and beautiful: that's what Rafiq Azam aims at in his architectural plans. One gathers this from his two exhibitions of slides and posters seen at the Bengal Gallery, the recent one having begun on December 15. His forthrightness in pointing out the cause and effect of the lack of adequate town planning -- which is the concern of Dhaka dwellers -- also catches one's attention. 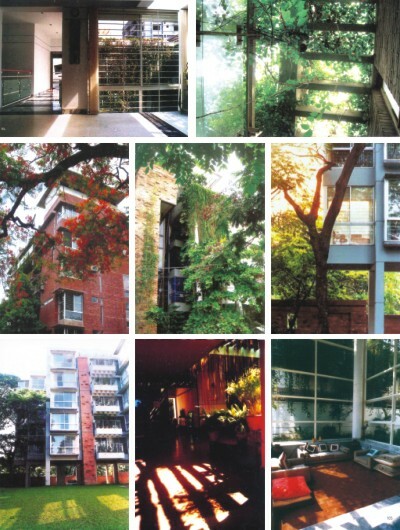 People pine for light, air and space in their homes in their apartments-- whether they live in the Old Dhaka, Dhanmandi or Gulshan, as Rafiq Azam puts it. The mindless jerry-builders have had a field day in suiting their clients’ desires and nobody else’s. Consequently, those with tight budgets are at a loss as where to turn to avoid high rents. Rafiq , in his repeated lectures, impresses upon the need for environmental preservation. Industrialisation brings in its unavoidable scourge of overpopulation with the influx of migration from the outskirts of the metropolis. To combat that one dreams of something "healthy, functional, and something artistic" says Rafiq Azam. Living itself is an art, as Heidegger put it, and existence must be more than just bearable in the long run. "Architecture must be conceptual, that is to say what is OK in the US is not so in Bangladesh, as the climate is absolutely different. Our sun inclines to the south, most of the time, in Bangladesh. In Australia, for instance, it's the other way around. To receive the winter sun, the houses should be south- facing, basically. Regarding the wind, we have the local one -- sweeping in from the Bay of Bengal. For summer comfort, our houses must face the south and the south-east, to catch the wind and let it flow out to the north." The climatic conditions of the houses are vital for builders, says Rafiq Azam. He tries to keep some space in which water can be absorbed and be collected in the ground-water discharge. We can filter the earth for drinking purposes, he says. Also, "rain harvesting" maybe done by collecting water on the top of the roof in containers. Due to the occurrences of earthquakes, there is the "pendulum effect" on water collected on the roof. Asked about the recent fear of earthquakes in Dhaka, Rafiq Azam says that we've always had it due to the shifting underground layers of earth and water. Gaps on the ground, under the houses, occur due to sudden heat or moistness. These have existed recently on the Zia International airport runway, and all the way through the Dhanmandi Lake. Chittagong is a more earthquake -prone area, as also Sylhet. Bangladesh is a "Zone-2" area for earthquakes. However, this is not as severe as places like Japan, says Azam. The jolts, he says, are an indication that the earth undergoes oscillations. Ten years ago, this fear was there, he says, but at that time the multistoried buildings were limited in number. Now, people live in twenty-storied apartments and may not be able to escape in case of an emergency like an earthquake. The concentration of population is not being checked and consequently combating earthquake is a big issue now, he adds.
" I'm still pursuing my attempts to bring in better lighting effects for my economical houses. As the buildings are becoming higher in Dhaka, new rules have come into existence, i.e. 'Nirman Bidhimala-2008' which states that more space has to be kept on the ground, around the houses, for rainwater and green growth. We try to solve this problem in an economical way, as is done in Japan of late. Another issue Azam focuses on is the reduction of the use of artificial lighting and cooling, in order to lower the consumption of electric power. “The houses, I insist must be economical, healthy and aesthetically pleasing,” says Azam. “As we are moving on in space, upwards, we're losing the 'ground -green'. The detachment from the green may create complicated situations for the children, in particular. This also ushers in lack of oxygen. My architectural firm 'Shatatto' puts in greenery at different levels, to bring in the vital connection with nature --the greenery and oxygen. There must be a link with the natural beauties around us at every level of the housing area." Talking about the areas that he caters for in Dhaka, Rafiq Azam says that their projects stretch from Khwaje-Dewan, Lalbagh, from Dhanmondi to Shantinagar and Gulshan. He does not concentrate on a specific place. He also handles areas in Chittagong, Cox's Bazar, Rangpur and Khulna. He has assignments overseas too as in Chennai and in Malaysia. 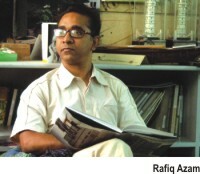 Rafiq Azam is the principal architect of Shatotto. The has been teaching at the University of Asia Pacific,Ahsanullah University of Science and Technology, Brac University, Dhaka, and has worked as a Research Associate , Conservation Study of Old Dhaka, Dept. of Architecture, BUET. He has 23 awards from home and overseas, including the "Mimar International Design Competition- VII, London, and the "Jawaharlal Nehru memorial gold medal". His exhibition at the Bengal Gallery will go on until December 26.